Contractors! 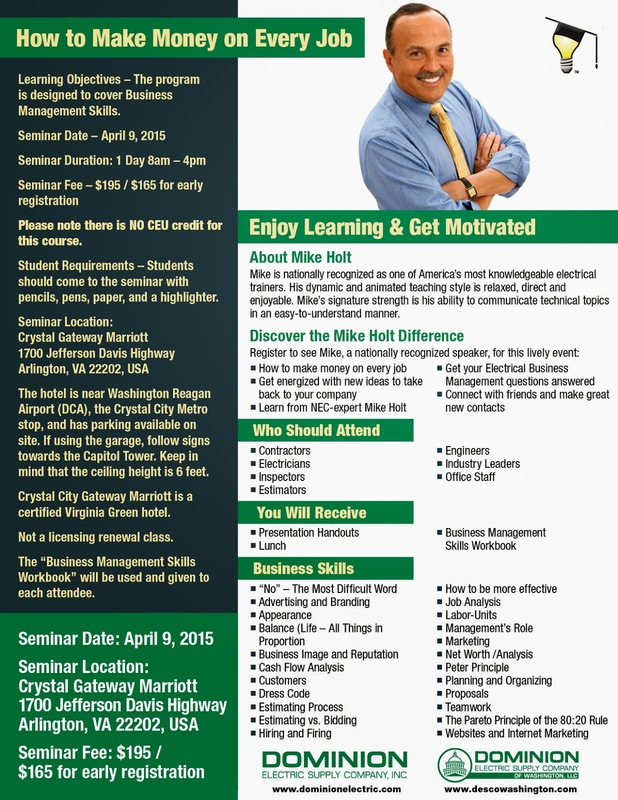 Learn How to Make Money on Every Job and more! Mike is nationally recognized as one of America’s most knowledgeable electrical trainers. His dynamic and animated teaching style is relaxed, direct and enjoyable. Mike’s signature strength is his ability to communicate technical topics in an easy-to-understand manner. Mike did a video just for us to tell you more about the class. watch it HERE! Learn how to make money on every job! We hope you can make it! Register with Greg Tiedemann at Dominion Electric Supply Co., 571-581-3388 or print and fill out the registration form here. Labels: Business Management Skills, Mike Holt, Mike Holt Live!